At the very end of US Route 1, the fabled highway running from Maine to Florida, lies the enchanted isle of Key West. The southernmost point in the United States is commemorated here with a marker, a large buoy and concrete pad to which Key West residents and visitors often go in order to take vacation pictures and watch the beautiful sunsets. Bordered on the east by the Atlantic Ocean, to the south by the Florida Straits and to the west by the Gulf of Mexico, Key West is a true island surrounded by water on all sides. The drive to Key West down the chain of Florida Keys is beautiful. While on a trip to another Key we decided a day in Key West was in order. We pack the car, get gas, cross the Seven-Mile Bridge (yes, it is seven miles across water on a two lane bridge), and head south for the end of the road. Having left early in the morning, we plan a full day in Key West and an early evening drive back up the chain of Keys to our temporary residence. We already know some Key West facts. As the county seat of Monroe County, Key West has a very low crime rate and a very low traffic fatality rate. (We surmise that the traffic fatality rate is low because most people walk or bicycle everywhere since the island is small enough to make that practical). Key West is located only 90 miles from Cuba, and near the Bahamas. Ernest Hemingway wrote some of his famous works while living in Key West, including “Farewell to Arms”. No road led to Key West until the 1930’s when the Overseas Highway was extended to reach the last Key. 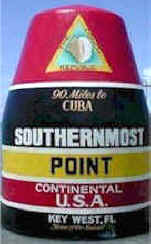 The Border Patrol put up a roadblock in 1982 during the time refugees were fleeing Cuba and Key West protested this disruption to their tourism-based economy by informally seceding from the Union. Calling themselves The Conch Republic and claiming foreign countries received better treatment from the US Federal Government, the charade produced international attention to their plight. In Florida, the rules are different - in Key West the rules are very different! Everyone is always dressed very casually in shorts and “slaps” (flip flops), often with straw hats, unless they are dressed for work. And that’s only if they choose not to go out in their beach wear! Festivals occur on most any excuse and Key West is the home of the Fantasy Festival, similar to Mardi Gras. Fantasy Fest started as a gay-oriented festival but now everyone shows up. Our primary destination this trip is the Duval Street area, center of the Key West party zone as well as home to some great history and architecture. First, we drive around the island and view some of the larger resorts and hotels. Looking at the water near the beach, the clearness and color amazes. Then we head to the Duval Street area on the southern end of the Key and locate a parking space, which proves rather difficult. After finding one only two or three blocks off Duval Street we consider ourselves very lucky and begin our “street crawl” of the area. We park near the north end of the Duval Street’s center of fun and begin our tour at the Bahamas Market. Here you can buy baskets and island-style clothing and view the Lighthouse Museum from the exterior. Continuing south we note several blocks of impressive old architecture, obviously from the 1920’s and 30’s. Large homes with tropical landscaping, once home to famous residents of Key West, grace the surroundings. Soon we are in the heart of the Duval Street party district. Sloppy Joe’s is a landmark in Key West and we decide to drop in for a rest and a drink. Sloppy Joe’s t-shirts are a must-take-home item, so we buy our first mementos from Key West. Nearby is Jimmy Buffett’s Margaritaville, and of course a stop there is mandatory. All the clubs and restaurants in Key West’s Duval Street area are very casual with people popping in and out. Some of the locals drop in with their pet parrots or news of local happenings. Everywhere we stop, Conch Fritters are on the menu, being a very popular local and tourist food - and very good to boot! We decide to eat a plate of fritters and continue our tour of Key West. Toward the southern end of the Duval Street area we locate a local sandal maker, Coach Leather, that makes sandals to exactly fit your foot. I’d love to buy a pair, but decide to wait until next visit since it would take too much time and we have lots left to do today. We reach the oldest house in Key West, across from Key West Hand Print Fashions, which of course I have to visit. Then it’s time to turn around and retrace our steps back to the car. We’re not leaving yet, just relocating. Driving toward the southern end of the island, we locate parking not far from Mallory Square and begin our tour of the south end of the island. We visit Harry S. Truman’s “Little White House” where the President visited often during his tenure. Truman even suggested the U.S. Capitol be relocated to Key West - that was before the Conch Republic seceded, of course! Next stop is the Maritime Museum where the history of Key West shipping can be learned and many interesting displays viewed. We the pass the Old Customs House, the Shipwreck Historium, and the Key West Aquarium to stop at the Sponge Market and see all the shapes and types of sponges that come straight from the Ocean. By now, sunset is approaching, and we go to the southernmost point to watch the sun melt into the Gulf. Key West and the Florida Keys are one of the few places where you can see the sun rise and set over water. The view is beautiful and a not-to-be-missed event. The day we visited, the sky was mostly clear with only a few puffy clouds which reflected the pinks of the setting sun in all its majesty. Having a lengthy drive ahead of us to get back to our motel in the upper keys, we reluctantly leave Key West. Slowly the sky darkens as we depart this historic little town and we begin to plan our next return trip. Anyone who gets the chance to visit Key West will find fun and entertainment. The festivals bring large crowds in the Mardi Gras style but I find I prefer the slower life of a regular day at Key West. Many people, however, love the festival atmosphere. Whichever and whenever you choose to visit Key West, you won’t regret the trip. The Key West Chamber of Commerce site offers business directory, events calendar and visitor information. Nearby cities to check for activities and attractions: North through the Florida Keys. Fly or boat to visit the Fort Jefferson National Monument in the Dry Tortugas. CLICK to get Florida historic places, maps, driving distances, state and national parks, fishing info, etc. that relate to this city, others nearby and travel links..